Hepassocin antibody LS-C712154 is an HRP-conjugated rabbit polyclonal antibody to Hepassocin (FGL1) from bovine and cow. Validated for WB. 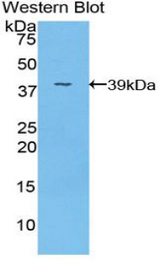 Recombinant FGL1 (Leu23-Val312) expressed in E. coli.